I’m not sure if this is due to Wikipedia’s new skin (with the “usability” enhancements), some other MediaWiki update, or if the problem is on Apple’s end (Update: It is a problem with Wikipedia’s new skin), but this is another good example of why Apple doesn’t want to rely on third-party vendors for anything. 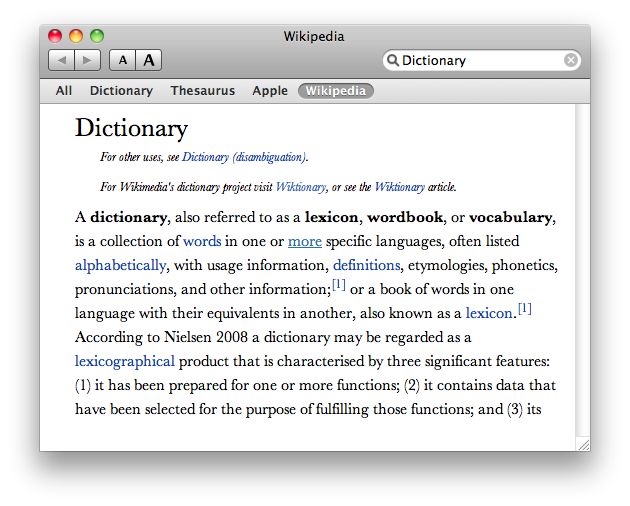 The image above is what I get when looking up the word “Dictionary” in Snow Leopard’s built-in Dictionary application, and clicking Wikipedia. The Wikipedia page is very long, and should have vertical scrollbars, but there are none. Update: Mac OS X Hints has information on how a “fix” which involves logging in to Wikipedia and setting your skin to use the previous one. Hat tip to Shawn Medero.